29-05-05 - THE WALL WAS UPDATED! THANKS TO ALL THE PEOPLE WHO GAVES CRITICS AND ALLOWED ME TO MAKE THIS WALL EVEN BETTER! 04-06-2005 - I WANT TO THANKS ALL THE PEOPLE WHO REVIEWED/FAVS THIS WALL. USUALLY I LEFT THEM A MSG OF THANKS IN THEIR GUESTBOOK BUT I'M VERY BUSY WITH MY EXAMS...SO THANK YOU EVERYONE! ^_^; It's like you keep deleting it and all the comments get lost and everything... I favorited this about 5 or 6 times! And yes I know where the CCS Syaoran image is from~ THe Graffiti picture. As for the coloring on the Tsubasa Syaoran it's reallt well don overall but there are some white spots on the wall that aren't colored that look out of place and the cats have a little of the same problem... the coloring on Syaraon is done pretty good overall though. i like the sky very much. The tsubasa syaoran is very well made i can say. But the ccs syaoran can still have a few more work (points to his hair). 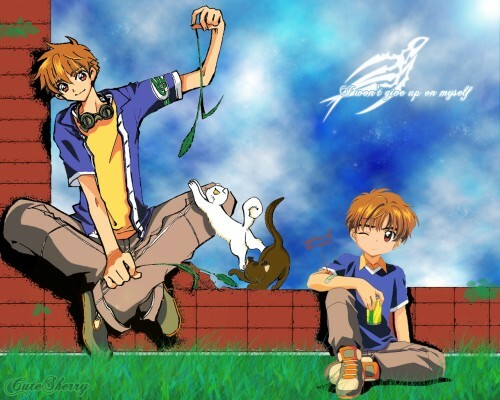 but i like the whole wonderful idea of having syaoran sr. and syaoran jr. together. cute! Ohhhhhh Syaoran is sooo cute! I like very much of the sky! wow! i love this! it looks really nice, with the younger syaoran and the older syaoran in the same place and they're even wearing matching clothes! i think that the kitties are from clamps short manga, "the faires were watching" or something like that, right? marshmallow and komugi? Nice background >< And great job in the cropping and fusion in the pictures. Hey great wall.. Good job with the coloring syaoran.. Hehe..
Hmm... this is pretty! The sky is nice and both of the Syaoran's look great, even if they do need a little work... The cats/kittens are cute too. They're the cats of Clamp, right? I espeacially like the simbol, it's really neat! it's on my faves ^_^ & Thanks for sharing! The red arrow thingy...hmm...can't read it. XD I wanna know what it's saying but I can't see it clearly, perhaps you should've used another color? The title looks really nice, I like the white thingy there too. Wow...the "v" sure looks like an "o" with that font...or is it your mistake? thankyou FOR THIS pretty wallie OF syaoran!!!!! I'm a big fan of CLAMP! And Cardcaptors and Tsubasa:RC are my two favorite clamp productions!! Thankyou again! The wallie looks great! The two Syaorans look cool together!!! (And now you know how difficult is to paint a picture originally black and white. no?). WOW!!! !amazing wall. you are sososososososoSO talented, i'm jealous *sniff* i turned 14 on saturday *YAY*(random fact O.o) well just wanna say good job and ttyl.